Over the next two months we will be reporting on various aspects of summer 2017, including official statistics. Our very clear aim, in planning for the first new GCSEs in summer 2017, was that the transition should be as smooth as possible, and that the students taking them would not be unfairly disadvantaged by being the first to sit these new qualifications. The transition to the new GCSEs was generally smooth. In maths, schools appear to have made appropriate tier entry choices for their students: there were fewer students this summer who were ungraded on the higher tier and no students scoring full marks on the foundation tier. However, some commentators expressed concerns about the grade boundaries in GCSE maths. Much has been written about the ‘low’ grade boundaries and how they are lower than previous years. This has been interpreted as Ofqual lowering the boundaries in the first year of a new qualification. Unfortunately, it’s really not that simple. The new maths GCSEs were designed to be different from the old A* to G GCSEs, so you really can’t compare new and old. Here’s why. First, the available grades on each tier are different and the overlap grades are different. Previously the highest grade on the foundation tier was a C. In the new GCSEs, the highest grade on the foundation tier is a 5, a grade which spans the top of a C and the bottom of a B. The overlap grades –those available on both tiers – are 5, 4 and 3. That’s higher than the overlap on the previous qualifications of C, D and E, which probably explains the shift towards the foundation tier entry this year. In a higher tier paper, half of the marks should be targeted at grades 9, 8 and 7 and the other half of the marks should be targeted at grades 6, 5 and 4. In a foundation tier paper, half of the marks should be targeted at grades 5, 4 and the top of grade 3 and the other half of the marks should be targeted at the bottom of grade 3 and grades 2 and 1. This is shown in the infographic below. Targeting questions is always tricky, but this means that higher tier papers now contain more demanding questions and only about a sixth of the marks on those papers are designed for students working at grade 4. In that context, it’s not surprising that the grade boundary for a grade 4 on the higher tier papers was around 20% of the maximum mark. But that doesn’t mean there is anything wrong with the papers. Rather, it’s a consequence of having to discriminate more at the top end but also provide sufficient challenge across the ability range. If there were more marks targeted at grade 4, grade boundaries might be higher, but exam boards would be criticised for making their papers too easy, and it would mean fewer marks available to differentiate the very good students at the top end. As schools and colleges become familiar with the new assessments, we might expect performance to improve slightly. And of course, grade boundaries will be set each year to reflect the difficulty of the papers. But we should not expect to get to a position where students have to score 50% of the marks to achieve a grade 4 on a higher tier paper, unless we redesign the papers to include many more questions targeted at grade 4. There is nothing in here to disagree with in terms of 'fact' but I think we need to check that the boundaries pass the general public 'smell test'. 20% for a 'standard pass' just doesn't sit well with many of the general public - it seems too low. I don't think it's realistic for the general populous to ever be aware of the workings of tiers of entry, overlap questions and the like so it's important that the qualifications and grades stand on their own two feet. Given that around 75% was enough to give students the new 'superstar' grade 9 and around 55% enough to get a grade 7 (equivalent to the old A grade) it seems possible to make the papers slightly more accessible whilst still leaving plenty of space for the most able to showcase their abilities on the exam paper. Interestingly this year a student could, just about, get a grade 7 without getting any of the grade 7/8/9 questions correct as long as they got 100% on the grade 4/5/6 questions. I wonder if a 60/40 split between the easier/harder questions on the paper might mean that the grade better reflects, for those at the lower end of the grade spectrum on a paper, mastery of topics rather than potentially just picking up lots of 'bits and pieces' method marks. This might mean that the boundaries for grade 7 and 9 move up to around 65% and 85% which seem quite reasonable and pass my 'smell test'. In terms of the marks required to get a grades 4 that would rise to around 30% for this 'standard pass' and around 40% for a 'strong pass' (grade 5). That would be an improvement but still may be considered slightly 'smelly'. Mt preferred option - as a maths teacher - would be to return to the days of 3 tiers so that students awarded grades 4/5/6 had to genuinely show mastery of some more complex topics to get those sorts of grades. I think when a student gets 100% in grades 4/5/6 shows that they are obviously on a higher level so should deserve a grade 7. If students are capable of achieving full marks on the foundation tier papers, they should probably be entered for higher tier. In maths in summer 2017 there were no students who scored full marks on the foundation tier. It's the "targeting" I have problem with. You state yourself it is tricky, and indeed it is. What may seem like something targeted as 4, 5 & 6 may not be dependent on understanding of individuals. Or have you defined a general list of concepts, methods or even topics that are deemed to be grade 4, 5 & 6? I love Cathy's blogs. Any chance of one on how you set the grade boundaries for the November resit? It seems a difficult task to make fair so I'd be interested to hear how it's done. Now that most of the grade 3 students will have done foundation rather than higher at their schools there could be a shift this year. Can this higher and lower tier grading system be extrapolated to Science? 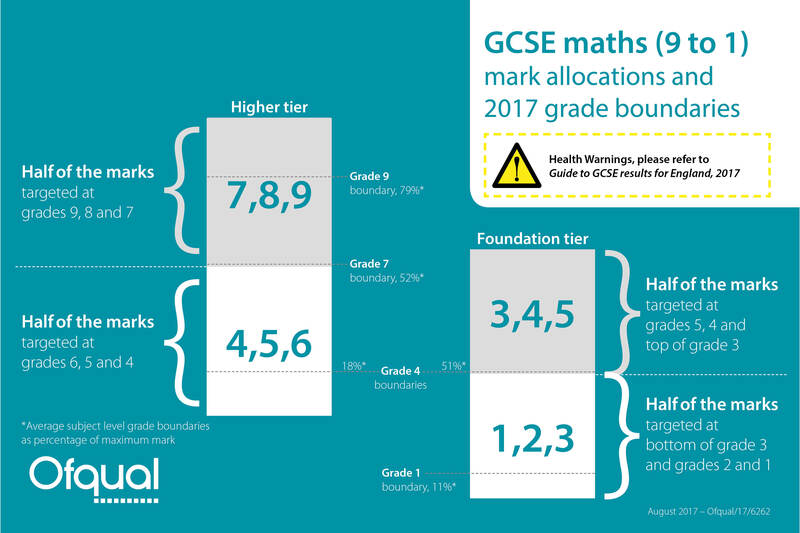 Foundation Tier is now best for many pupils, specially borderline ones where previously C was the goal but it was hard to decide which tier gave them the advantage. The title Foundation puts off many pupils and their parents who think they are doing very simple maths. It should be changed to a more appealing name such as Essential or Standard Maths, specially now the content has increased. namely to suit higher achievers . The difficulty at present is trying to be very broad in scope in the exam and span 4 to 9, resulting in 4 achieved at 20 per cent, or less, which frankly sounds odd. The best way forward is to make a standard exam of two papers for EVERYONE , spanning 1 to 5 or even 6.It could be called Essential or Standard Maths. Then those capable and aspiring to a higher grade can sit one extra paper targeted at 6 to 9.Their result from the 3 papers combine for a final grade. A high grade such as 8 or 9 would then be far more meaningful than under the present arrangement. This is very much like a driving test where everyone has to pass the basic one . Anyone wishing to go beyond takes an advanced course. With some tweaking this might be a way forward to remove perceived anomalies. Quite frankly – I wish we could turn the clock back and simply bolt on some extra really tough problem-solving questions on the old higher tier and make the paper 2.5 hours, instead of the old 2 hours. Then award A** for those who could get stuck into them and do well. Problem solved. To add to the previous comment, all students, employers and most teachers would rather the clock was turned back. There seems more emphasis on content and not enough on depth and interlinking various skills. ThIs weakness immediately becomes apparent when grade 7,8 or even 9 pupils move on to A Level as they only know topics in isolation and their application in limited cases . Interestingly, in places where pupils excel in maths, the stress is to "think like a mathematician" rather than cover miles of content a few inches deep. Ask the best A Level pupils when the hour and minute hand on a clock face coincide or what compounded yearly % increase equates to a 20% increase over 5 years and few will think it out. The present exam is more stretching for many pupils and that is welcome but they need more back up in their earlier years so they can be well prepared for it. For the best pupils more of the really hard questions are needed throughout their course and in the exam to make a top grade truly stand out. It should really be the right of the student whether they think they are capable or not of taking foundation or higher it should not be anyone else's decision. Not even a teacher's. The right of a student must be more firm as it their own future not anyone else's and not their teacher's. If a student believes they have the potential of devoting themselves to hard work then why shouldn't they be able to decide their own tier? I know a school which have been putting students into foundation to save their high percentage of 9-7 grade student. As the percentage is taken from the higher tier candidate thus having less students who are more likely to get a 6 or just make a 5 are sent to foundation to keep their percentages higher in the higher tier group. This system has become ridiculous many students this month have become very distressed due to the fact they may not be able to make a 6 as they have been entered ,without their consent, into foundation. hence stopping their chances at A levels. The right of the student must be heard the choice of foundation tier and higher must be the student's. A major problem with the current system is the wide range of difficulty that is necessary on both papers, but particularly the higher. A student who may be striving for a grade 6 is faced with a paper where approximately 50% of the questions are likely to be inaccessible to them which surely cannot be a good experience. A much better system would be a return to three differentiated papers ( like the old higher, intermediate and Foundation) that target grades 7-9, 4-6 and 1-4. And only two papers instead of 3. Same amount of marking but a better experience for students I would say. Are the grades awarded across different exam boards moderated? If a limited number of high achieving schools select a board that is harder this will affect standard distribution. Making it more difficult to get higher grades for that board. The approach that we use takes account of that. If the students taking exams with one board are more able overall, they will have higher predicted results than another board. The boards are required to send us their provisional outcomes and we review the data for all specifications before results are issued. There is more information here.